Sound (7.6/10) – Despite its ominous moniker, the GR02 Bass Edition doesn’t add a whole lot of low-end grunt to the sound of the older R02ProII model, which, admittedly, was hardly bass-shy to begin with. The low of the GR02 is punchy, but not inaccurate and the earphone is not quite a bass monster. There is a similar amount of deep bass compared to the cheaper GR99 but the mid-bass is dominant source of power with the GR02. Despite this, the Bass Edition also gains a bit of detail, control, and dynamics and can be more impactful than the GR99 when pressed. The GR02 is also bassier than the higher-end GR06 and its low end can overshadow the midrange on occasion compared to the more mid-forward GR06, the more subbass-focused GR99, and more balanced-sounding sets such as the Monoprice 8320. The note presentation of the GR02 is thinner compared to the GR06 and the midrange clarity is a bit better. The mids are less liquid and intimate compared to the GR06 but warmer, cleaner, and a touch more forward compared to the GR99. The top end of the GR02 bears some resemblance to the GR06 and GR07 models, with good presence and extension but a slight predisposition towards pointing out sibilance on tracks. For the price there are very few sets that do treble this well without sacrificing brightness as the lower-end GR99 does. Similarly, soundstaging prowess lags a little behind the higher-end models but is more than acceptable for the price. The soundstage is average in size and lacks the separation and layering of the GR06 but still provides a well-rounded sonic image for a satisfying experience. Value (10/10) – VSonic’s new lineup continues to impress with this re-tuned take on the aging R02ProII model. An impressive performer with a focus on mid-bass punch, the VSonic GR02 Bass Edition provides unexpected bang for not very much buck and – from the durable, time-tested housings to the tangle-resistant cable and 28-piece tipset – doesn’t feel one bit outdated. Hi. After searching the net i found your recommendations. Can you please tell me of this headphones are ideal for heavy metal music?? If not i would be glad to reccommend it something in the same budget and quality. Thank you in advance. Hey, Joker! about 8 months ago I bought a pair of Meelectronics a151’s that you recommended me, and I’m extremely happy with them, but I kinda want something that has more base now, not basshead level, but warmer than the a151’s. Do you think these GR02’s would be good? If not, what would you recommend for a $50-$60 budget? Thank you! GR02 is probably a little less smooth than you would want coming from the A151 – it’s v-shaped more than it is just warm. If you can deal with its cable, the Sony MH1C would be my pick with a wide margin. Fantastic earphones for a “warm and smooth” type of sound tuning. Not basshead level bass, but plenty deep and with good impact, without killing clarity or smoothness. If the MH1C’s cable is a dealbreaker, then a v-shaped earphone may be your best bet. Not necessarily the GR02, that one is a little extreme coming from the A151, but maybe the Philips SHE3580 (or 3590), or the Soundmagic E10. Yeah, the cable on the MH1c is a dealbreaker for me. But what exactly do you mean by the GR02 BE’s being too big of a jump? Too much base/highs and mids are to recessed compared to the a151’s? And the other two options that you gave didn’t interest me that much. If you really think those are the best for me, then i’ll research even more about them, but do you have any other recommendations? Thank you once again. Yes, that’s exactly what I mean – too deep of a “V” shape to its sound. You can certainly try it and there’s always a chance you will like it, but generally I think something like the GR02 will sound way “off” for someone used to the A151. Thank you Joker for such a great review! Currently I am confused between these IEMs, GR02 BE, Carbo Tenore, Carbo Basso, VSD3S, and SE112. I listen to pop, jazz, accoustic, and some electronic/house music. Could you recommend one with the best overall SQ please? I need a sufficient quantity of punchy bass in my music. Any other recommended IEM for my music will be very considered. Thanks! I am not familiar with Carbo IEMs but I do like the VSD3S a lot in this price range – it’s my highest-performing (overall) earphone with a reasonably accurate sound. I also like the Ostry KC06 – it’s smoother than the VSD3S and has more prominent mids, but also lacks a bit of the VSonics’ bass depth and punch. If you wanted to go more bass-heavy, the best bet would probably be a Xiaomi Piston 2 but for me the VSD3S has sufficient bass. Well Carbos are frequently mentioned at HF. I really think you should review those lol. Anyway, about VSD3S vs Piston 2, who will play music like Kygo’s the best? I need that kind of bass to be “present”. Not really much, because I don’t want other instruments and sometimes the vocal muffled by the bass. Either will do fine IMO. Piston 2 is probably the safe choice since you don’t know the exact bass quantity you’re after, as it will give you plentiful bass and also smoother vocals compared to the VSD3S. The VSD3S, as is often the case with VSonic products, is a more polarizing choice that gives you the best clarity and resolution in the price range, but also can be a little harsh/sibilant depending on your personal tolerance and doesn’t have THAT much bass. 1. Is it that bad? (the sibilant) And would that be decreased with different music files type I am playing, like .flac or 320kbps .mp3? Sibilance is generally considered a negative but some people are much more sensitive to it than others. Good recordings usually don’t help – some artists/bands/masters are just more sibilance-prone than others. Going to a different recording/master of the same track sometimes helps if you’re trying to filter out something specific. There’s not much difference between the VSD3S and VSD3. I think the 3S is a little smoother and is the one I’ve always had (and recommended). The non-detachable version is newer and is the one I’d get. It seems VSonic gave up on detachable cables for this product. Colors are colors.. if you don’t care what color it is just get the cheapest one. Such a great websites you have here. Keep it up bro! but if you have any sugestion whit clear sound stage and low-mid bass in ear, i really appreciate bro thx for your work. The vPulse is great if you need tons of deep bass and are worried about comfort. If you don’t need overwhelming bass but just a good amount of impact and warmth, there are other good options. Xiaomi Piston 2: https://theheadphonelist.com/headphone_review/xiaomi-piston-2/ – I often recommend this over the vPulse due to it being better-sounding and less expensive, but it is bigger and fatter. Two other great-sounding earphones that aren’t very slim – the JVC HA-FXT90 (https://theheadphonelist.com/headphone_review/jvc-ha-fxt90/) and Audio-Technica ATH-CKM500 (https://theheadphonelist.com/headphone_review/audio-technica-ath-ckm500/). Both can be found well under $100, both are on the large side, but I find them about as comfortable as the GR02. My question is, for rhythms like R&B, Dance, Dubstep as daily dose. Bass quality or quantity which one its needed more to enjoy plentifull m4a and flac formats? and RHA MA750 vs EPH-100 who wins in that rhythms? thx for your reply bro. You need both bass quantity and quality – the right balance of them for your genres and listening preferences. I would lean towards the EPH-100 as the best choice if you can swing it. It’s usually the priciest of the bunch. Your website is fantastic and because of it I picked up a pair of VSonic GR02 BE, but now they are dead… I love the sound of the GR02 but want something different. Can you recommend me a pair of IEMs that have bass and a soundstage that is similar to the GR02 BEs but are clearer? Tough call.. the sound of the GR02 BE is pretty unique. Maybe a Brainwavz S1 or Rock Jaw Alfa Genus (if within budget). They maintain a bass-heavy sound with good clarity (at the cost of some treble lift) and decent soundstaging. Are the vsd1s good for edm I bought one from lend me UR ear from singapore from amazon is this a trusted seller sorry I have ocd lol I should be fine right no fakes ? Lend me ur ears happens to be an authorized VSonic distributor. How does this compare to the vsonic vsd1s and the vsonic vsd3 and should i be worried about fakes? These are the less refined, less balanced, less accurate, but more bass-heavy cousin of the VSD1 and VSD3 (which are both much newer). Not recommended over the VSD models unless you specifically want heavier bass. No fakes as far as I know – they’re pretty inexpensive to start with and have never been that popular in the US or Europe. Hi. Is the midrange of the vsonic gr02 bass edition recessed compared to that of the soundmagic e10/ e10s ? Yes, the E10 sounds more balanced overall. What’s the difference between Vsonic gr02 bass edition and Vsonic VSD1/ VSD1S in sound signature and overall sound quality? Which one of these has the best bass and sub bass quality and smooth treble (i mean not metallic or harsh)? Thank you. The GR02 BE still has the most bass of the budget VSonic sets I’ve tried, with good amounts of both mid-bass and sub-bass. Overall v-shaped profile with more recessed mids compared to the VSD1S, GR07, etc. Has typical VSonic sibilance. Good if you like heavier bass and/or a more v-shaped sound. The VSD1S is a better overall performer but more balanced and less bassy (especially deep bass). Has a healthy amount of bass, just not as much as the GR02BE. It’s also a little more forgiving of sibilance, but still isn’t exactly smooth. 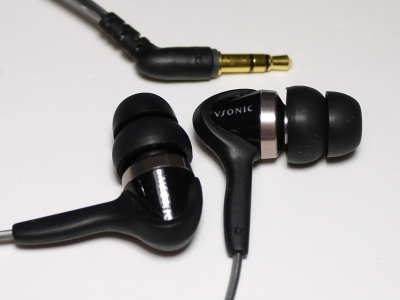 Typically VSonic is not at the top of my recommendations for earphones with smooth treble. Thank you. So which in-ear earphones do you recommend which have the bass like gr02 bass edition but with a smooth treble? (I ordered these from smoothest to least smooth, but they are all more smooth than a GR02 BE. Personally I like the MH1C and S1 the best). Hello sir. How does the vsonic gr02 bass edition compare to the soundmagic e10 in terms of bass quality and also quantity? The GR02 has a slightly more bass-focused sound whereas the E10 tends to be a little more balanced overall. In terms of how the bass is presented, the GR02 has a good amount of both mid-bass and sub-bass whereas the E10 has less sub-bass. Other than that, quality is pretty good on both.